- Audio Guide for Android Smartphones or Tablets. - The Alhambra Tickets include the entry at the monument which allows Access to all areas open to the public. 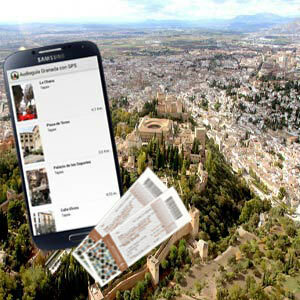 Choose the "Audio guide for Granada and Alhambra with GPS" and your tickets Alhambra and organize your day in Granada in your own way! Don’t wait for the queues, skip the line and enjoyr with our tickets Alhambra! A walk around the Alhambra, declared a World Heritage by UNESCO, is a required activity for every visitor of the city of Granada. Furthermore, it’s a work of art that calls out to us, maybe by its attractive and elaborate rooms, by its monumental and historic position or by the special charm of its exquisitely detailed Islamic art and architecture. The Audio Guided for Granada and the Alhambra made by Granavisión, contains audio and written explanations about the “Red Fortress”, descriptions about its decorations, histories about its more ancient legends that will help you to feel as you lived there at the time of the Moorish Kings. - Really intuitive and easy to use. - Able to be used without an Internet connection. - Download it on your Smartphone (You need at least Android 2.1 system or newest version / dimension 3,3M). - Delivery of the Audio Guide with a Tablet 7”(5 Hours autonomy) or Smartphone. 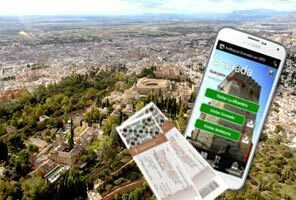 - In our device you will have access to all the information you need to plan your visit at this incredible monument and Granada, one of the most visited in the world. - You will find detailed information about every corner of the monuments with extra photos. 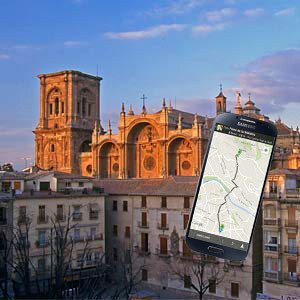 - GPS position in the Alhambra area: it will let you know where exactly you are and where the closest touristic areas are located. - Maps of the Alhambra and surrounding area with all the most important details, you will also have access to a PDF printable version. - Searching Options: You can easily discover where the place you were looking for is and learn all the information about it. 1)	Tickets to the Alhambra of Granada, include the entrance to the monument which allows access to all areas open to the public. One of our guides will give you the tickets. 2)	Alhambra Audio guide for Granada and Alhambra with GPS (Granada: -- The Alhambra: ). - Download from Google Play: App on your limited version for your Android Smartphone or tablet. Once the application is installed on your Android Smartphone or Tablet, introduce the details of the booking (E-mail and reservation number which will be sent with the voucher) for access to the full version (with all audio). - Or one tablet or smartphone provided to the customer with the audio guide already installed. You will be given in the Welcome Visitor Centre. 1)	Official guide to visit the Alhambra. 2)	Pick up and transfer back to your hotel. 1) Once the purchase is made, you will receive an e-mail with confirmation of the payment and the booking voucher. (ii) Once the application is installed on your Android Smartphone or Tablet, to the full content accer have to validate the app with your booking details (email and access code). b) If you've chosen tablet / smartphone, then you will be given in the Welcome Visitor Centre. 3) Print the voucher and show it to our tour guide. The voucher is the proof of the booking. You will not need to show anything else to get your ticket. Please note that you can always recover your booking voucher on our website in the section "My reservation" by entering your e-mail address and the reservation code.